If there’s ever a time when I wish to be an inanimate object, I’d like to be that teddy bear. Heehee. 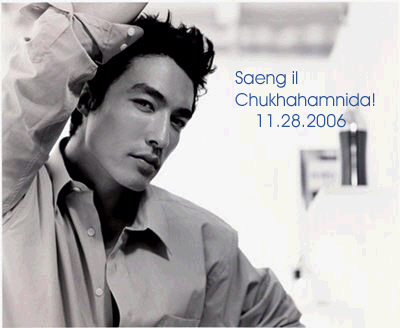 Happy 27th Birthday, Daniel Henney sshi! Stay hot, happy, and healthy always! With short hair and jeans instead of a suit, Daniel Henney looks relaxed and approachable. The man who in just two dramas — My Name is Kim Sam-soon and Spring Waltz — captured the hearts of millions of Korean women is now promoting his first feature film, Seducing Mr. Robin, which is released on Dec.7. The Chosun Ilbo spoke to the 28-year old. Don’t you think that you are playing on women’s fantasies a little too much? In this movie, your character is a Harvard graduate and CEO of a foreign company. Your fans praise your gentleness and sweetness, best represented in your smile. What kind of guy is the rest of you? Born in the U.S. state of Michigan, Henney dreamed of playing in the NBA when he was a boy. He was talented enough to be scouted to the University of Illinois at Chicago. But he says the talent others envied was not enough to reach the “top level,” and he was at odds with the team’s coach, whom he accuses of prejudice against him — the sole player with Asian heritage — so he finally changed his course. After that, he worked as a model and took acting classes, and debuted in My Name is Kim Sam-soon where he became widely known. An uncomfortable question. You said the coach at UIC had a racial bias. But don’t you think that the fact that you are of mixed race worked in your favor in Korea? Would it be rude if I ask whether your activities in Korea are a springboard for something else, like Hollywood? A springboard? No way. The only good thing about working in Hollywood would be the fact that my parents could see the movies I’m in more easily. Whether it’s Hollywood or Korea isn’t important to me. The script, and what kind of a project it is, are what I consider most important. This work isn’t a stepping stone — it’s my life. What virtues must women have to seduce Daniel Henney, rather than Mr. Robin? First of all, a non-enhanced natural beauty. And what I like the most is the natural sound of laughter. Age changes appearance and body shape, but the laughter is unchanged when they turn 90, and even when they sit in a wheelchair. That is some smooth talk. But, how should I put this, it sounds like a canned response. (Blushes) Well, of course I can’t ignore the impression and feeling that I get from a woman when I meet her first. This is an English translation of an interview with Daniel Henney that appeared in the print version of the Chosun Ilbo. On another note, Harry Potter would like his spectacles back. And also, your hairstylist’s not happy because you’ve missed another appoinment. Unfortunately, I can’t say the same for Daniel Henney in the talent department. There are several reasons why. First, he has yet to master the Korean language. Although, he is constantly learning Korean, the language barrier still exists. Hence, in all the shows that I’ve seen of him thus far, his screen time was limited and he spoke primarily English. In addition to the language barrier, experience is also another factor that works against him because he is still quite new to the acting industry. However, from what he’s been displaying onscreen so far, I’d said he has potential. He also has plenty of charisma to spare. (More potential and charm than the person who he is usually compared to: Dennis O’neil, but more on that later.) He’s currently filming Seducing Mr. Perfect, so we’ll wait and see how he does in there. Who is Dennis O’neil? Dennis O’neil is another Eurasian actor that entered the Korean entertainment scene after Daniel Henney. His first drama was The Sweet Spy with talented Nam Sang Mi. Truth be told, I much prefer Daniel Henney than Dennis O’neal. In the acting department, the winner is obvious. It’s Daniel Henney, unless you consider expressionless face, voice, and awkward body movements acting. However, in the looks department, I’ll be fair and say that it depends on the eye of the beholder. Some may prefer Dennis over Daniel because they say he’s the better looking one. Well, no need to repeat how I feel as you probably have read the above section. Moreover, I think Dennis kind of looks like one of my friends. Thus, I feel that although he is an “eye candy,” he doesn’t have the star quality as he feels a bit “ordinary” to me. By the way, I had a dream about Daniel Henney recently. In the dream, he and I were hanging out together like we were best buds. It was a very lovely dream! Heehee. Which led me to thinking, “what would I do and how would I react if I were to meet him in real life?” I would love to meet him since he’s one of the few Korean actors that I can communicate with because language is not a problem. And you know what, I think first, I’ll be shocked and somewhat disoriented. However, after those two seconds have past, I’ll be able to regain my composure and offer to shake his hands (with one hand while the other hand is dialing for my minions to come to the scene in a giant white van so that we can kidnap him..muahhahahah.j/k). Nah, I’m not that crazy and obsessed of a fan. I’ll probably just shake his hand, address him as “Mr. Henney,” say that I admire his work, and wish him much success. Man, I really hope that that day will come..Heehee. It’s official. Daniel Henney has reached heartthrob status in Korea. The latest proof is a 40-line poem going around the Internet in rapturous praise of the Korean-American actor and model. What has brought on such words of devotion is Henney’s character in the wildly popular television drama My Lovely Samsoon. The MBC drama recorded a 41.7 percent viewership on Thursday, becoming the highest-rated soap opera this year, according to TNS Media Korea. Henney plays Henry Kim, a doctor in the United States who treats Hee-jin, one of the main female characters, who is suffering from cancer. As Henry Kim speaks only English, his dialogue always comes with Korean subtitles. However, the language barrier hasn’t stopped his fans from demanding he get a bigger role in the drama. His personal blog on Internet (www.cyworld.com/danhenney) gets more than 20,000 hits a day, crowded with his fans’ messages in English. “Everything happened so quickly. It all happened in two-days time after the drama was aired. I just love it. I am really flattered,” Henney, 26, said during an interview last week in Chongdam-dong, Seoul. Like his character in the drama, Henney comes from a multinational background. His mother is a Korean-American adoptee and his father British-American. Adopted before the age of 1, his mother speaks no Korean. In the drama, it is implied that the mother of Henry Kim is also an adoptee. In the drama Henry Kim is devoted to Hee-jin, played by Chung Yeo-won, even though she is in love with someone else. Instead of pressuring her to return his affections, Henry is always there to help her. The actor said he could understand Henry’s actions. “It just depends how much you love someone. I definitely think it’s possible,” he said, adding that he himself was in a similar situation in the past. Henney may be a newcomer to the Korean entertainment scene, but he is already a celebrity in other Asian countries. He has modeled in Hong Kong, Singapore and Taiwan and has numerous fan clubs in those countries. But before becoming a model, Henney said he was an introverted young man living in a small farming town in Michigan who loved basketball. His passion for the sport _ and his height _ led him to receive a basketball scholarship into the University of Illinois in Chicago. There, he received a degree in business communication and a minor in theater. “I used to be scared to speak in front of people so I decided to take communications as a major,” he said. Henney’s modeling career started in the U.S. in the summer of 2002 by accident. An agent saw him in a parking lot, where he was in a car waiting for his friend to come out a model audition. Since then he has been working as a model in the U.S. and various Asian countries and has participated in the Paris and Milan Fashion Collections. While modeling, Henney also studied acting at the Deena Levy Theater Studio, a renowned acting school in New York, where he also performed numerous off-Broadway plays. After his debut in Korea last year with an advertisement for the men’s cosmetics line Odyssey, he made commercials with actress Jun Ji-hyun for Olympus digital cameras and with actress Kim Tae-hee for Klasse air conditioners. Henney was at the airport on his way back to the U.S. when Kim Yoon-chol, the producer of My Lovely Samsoon, called him. “After getting an offer, I went to the U.S. and sent my videotape showing my acting performances,” he said. According to Henney, the hardest part about the drama is the late nights. “There’s one scene that I had with Kim Sun-a (who plays the main character Kim Sam-soon) in which she was speaking in French to me. We shot that at 4 o’clock in the morning. The next morning we came back and finished the scene. It is hard because sometimes you shoot something 2 o’clock in the morning and the very next morning at 7 or 8 you have to continue the same scene,” he said. But while the work is hard, Henney says it’s also a lot of fun, giving the shooting of one recent argument scene as an example. “Yeo-won as Hee-jin had to get really mad in the scene. So she was picking up Kleenex box and was throwing it. Henney has been in Korea for just a little more than three months, but he says he “strangely feels at home” here. Although his mother can’t see the drama in the United States, Henney said he will send her DVDs. After the drama, he plans to pursue movies in both Korea and America. He has currently pending auditions with American moviemakers. “I want to break through. It’s so hard for Asian actors to break through fully. But we are slowly making a way and I think it’s time. I have to have the right support behind me. I would also like to keep working here. Korean people are so amazing. The products, the movies that they make are such good quality. I would love to be the part of it,” he said. He also said he wished to break stereotypes about models-turned-actors by continuing to challenge himself. “There’s a lot of typecasts when you’re a model, someone who is supposed to be good-looking or whatever. (People assume) you are not going to be able to act and think that you’re always going to play the lover, and I don’t want to do that. I want to play many different roles and prove that I can do it,” he said. Despite his basic Korean skills, he said that he had it translated for him to completely understand it. “I can read Korean and understand it about 50 percent. But it’s really hard for me to speak and form sentences yet. Before I speak out, I like to make sure that I can do it properly, not to make a fool out of myself.” He added he spends most of his spare time studying Korean these days.